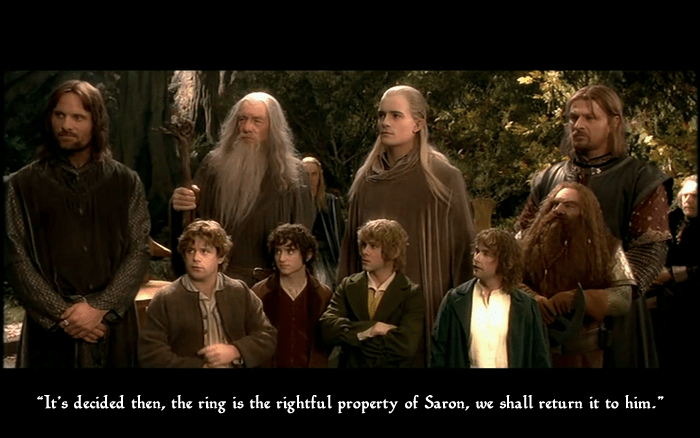 Not sure I would have stuck around to watch the rest of the film if this was the Fellowship's decision. As a part of my ongoing exploration of media, digital storytelling, (thanks ds106) and how to use both comical and satirical effect to help learners understand important elements of writing, I decided to attempt the most recent ds106 Design Assignment, “Messing with the MacGuffin”, using something that most fans of the cinema and the literary worlds are familiar with; the Fellowship of the Ring. The MacGuffin in this case is the “One Ring” itself, the ring that is so cursed that it must be destroyed, lest the entire world of Middle Earth be destroyed by the forces of evil who seek the ring. The ring is the plot device through which the journey of the story finds its impetus. Through coming into contact with it many of the characters experience life altering events (some even meeting their own demise). Without the ring, there is no story, there is no inciting incident, and there is little or no reason for the main characters to make their quest to destroy the ring. The existence of the ring, or the MacGuffin, not only compels a resolution other than an epic 8-hour fight scene in which the evil army is simply destroyed, but forces those fighting for “good” to completely dispell the evil force from the land forever. What happens to a story then when at a critical juncture, the MacGuffin gets “messed with”, twisting the plot of the story so far that it completely breaks off? How engaging would this be for high school students in a creative writing course, or middle school students trying to understand the importance of plot devices? It helps that the Fellowship of the Rings was made into a movie, so there are rich visual images to pull from for illustration, but you could easily have students create their own drawings or illustrations from novels and texts that have no video counterpart. Regardless of whether you have visual source material, being able to play around with concepts, often breaking traditional constructs of a story, is a great way to help assess if students understand the writing and story telling process. As far as the creation of the digital artifact above, I grabbed a screenshot from an HD version of the Fellowship of the Ring movie trailer from YouTube, opened it up in Adobe Fireworks (you can grab a free 30 day trial here), added the text, then saved it as a .png. The whole process took less than 10 minutes, but could easily be accomplished in many less “technologically advanced” ways. You could find an image via any image search, open it up in Paint (on a PC) or Preview (on a Mac), add your made up line that twists the MacGuffin, and you’re good to go! If you decide to make any yourself, or with your class, please share below in the comments! Nice Ben. I like the choice of font and the approximation of the actual language used. And you tell the story of the assignment well. Too fun not to do! excellent – we were just about to do one for Lord of the Rings. my son was thinking it through and he is laughing at this one right now. we’ll have to switch to something else now – great assignment though – we are having fun with it. Frodo goes and stands in the road, Nazgûl come and pick the ring up in a heartbeat, then it’s back to the Shire to relax and garden, fat and happy. What about the legalities of using copyrighted images? How can I be a good role-model for my students by asking them to use copyrighted images in their assignments? In the U.S. , this is Fair Use all the way. In a four factor analysis (purpose, nature, amount, market effect), 1) the purpose is educational (alter the story arc), 2) it’s a still from a movie, 3) a single frame, and 4) has zero impact on the market for the original work. That’s an excellent question Brenda, and unfortunately, the issue of fair use in regards to copyright law is one that far too many people misunderstand, especially with the amount of misinformation that large copyright holders like to produce. “The exception is for materials put to work under the “fair use rule.” This rule recognizes that society can often benefit from the unauthorized use of copyrighted materials when the purpose of the use serves the ends of scholarship, education or an informed public. For example, scholars must be free to quote from their research resources in order to comment on the material. To strike a balance between the needs of a public to be well-informed and the rights of copyright owners to profit from their creativity, Congress passed a law authorizing the use of copyrighted materials in certain circumstances deemed to be “fair” — even if the copyright owner doesn’t give permission. The truth of the matter is many teachers are inadvertently being poor role-models in regards to showing students how to safely, and legally, use copyrighted material for the purpose of constructing new knowledge. This leaves students with the false impression that they shouldn’t use anything outside of the classroom that wasn’t created by them. I hope I wasn’t too harsh in my answer to your question, but if you’re wondering about how to set that good example, you might want to explore the legal definition of Fair Use (http://en.wikipedia.org/wiki/Fair_use) as determined by U.S Law with your class. It would be interesting to see what you and your students would make of it, and would certainly lead to some fascinating discussion. Thank you Ben and Noiseprofessor for your responses here. I will confess that as an Elementary Music teacher I often tend to err on the side of the super cautious and opt just to create everything myself. I just don’t want to put myself or my students in a spot where a judgement could go against us. I have recently been approached by a teacher who is using Curious George as the theme in her room this year. She had all these images she had found on the web via Google Images and she wanted to use them to decorate her newsletter. Is that legal as well? Thanks for all your help! I really appreciate the links as well. I’m going to do my own reading on the topic right now.